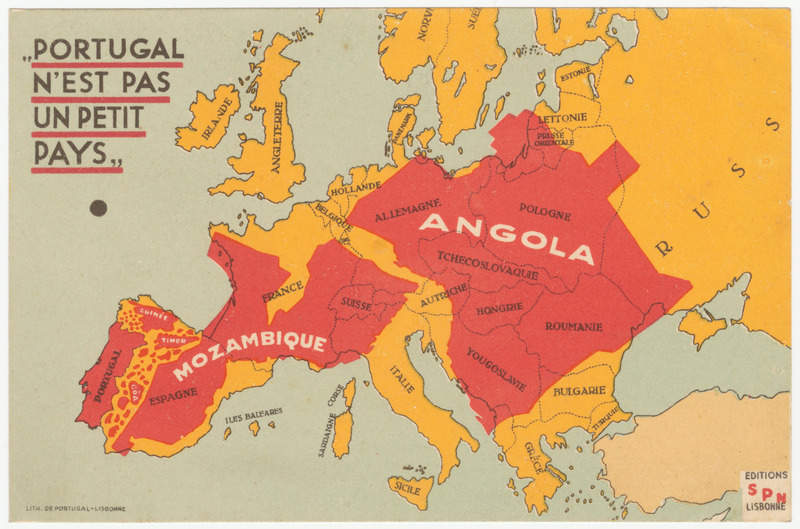 This map is based on one produced by Henrique Galvão in 1934, supporting the imperial ambitions of the then-new Portuguese dictator Antonio Salazar. See Notes and other information for ID #1237. That map showed the colonies of Portugal overlaid on a map of Europe accompanied by data showing that Portugal with its colonies (principally Angola and Mozambique) was larger than the total area of Spain, France, England, Italy and Germany combined. This map was produced in a number of other forms and formats over the years, many in Portuguese (aimed at strengthening internal support for the state) but also in other European languages (aimed at visitors to Portugal). The collection includes postcard versions of the map in Portuguese (ID #2120), French (ID #1238) and English (ID #2256). It was not uncommon for persuasive maps to be reproduced and distributed in postcard form, as an inexpensive means to reach a larger audience than posters. In addition to the examples above, see ID #1179 (Le Plan Pangermaniste), #1203 (Englands Not), and #1182 (L'Entente Cordiale).